Child themes allow you to make changes and customize your WordPress theme without ever editing the main theme. This allows you to continue to get theme updates without losing your changes. Recently one of our readers asked us how would he go about using his child theme on his wife’s website. In this article, we will show you how you can use your child theme on another WordPress site. Child themes are the safest way to customize and make changes to a WordPress theme. Take a look at our how to create a WordPress child theme article to learn more about child themes. 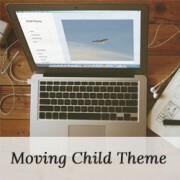 Child themes are completely portable, and you can use it on as many sites as you like. You can download them and install them on another WordPress site. 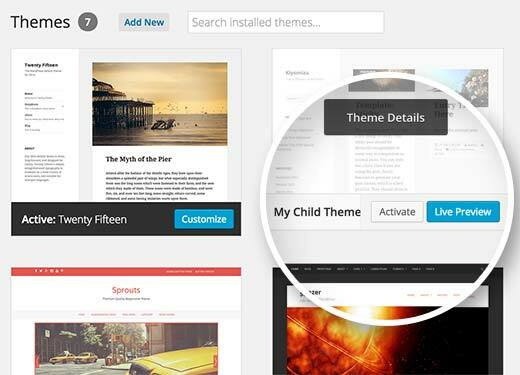 You can even submit your child theme to the WordPress theme directory for others to use if it meets certain standards. Before moving your child theme, you may want to take a look at our checklist of things you must do before changing your WordPress theme, and how to properly switch WordPress themes. These articles will give you a general idea about theme-specific settings that you need to look out for. Last but most importantly, make sure that you have complete WordPress backup of both your sites before performing any actions. 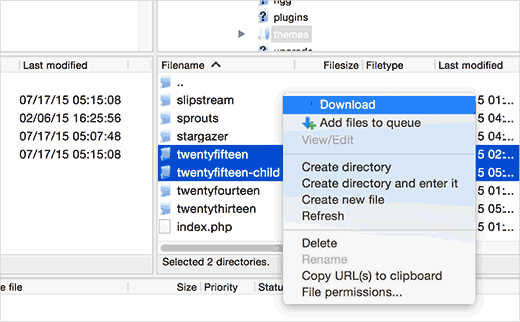 First thing you need to do is connect to your website using an FTP client and browse to the /wp-content/themes directory. Next, download both your child theme and parent theme folders to your computer. The next step is to connect to the WordPress site where you want to install your child theme using the FTP client. Browse to the /wp-content/themes/ directory and then upload both child and parent theme folders you downloaded earlier to the new site. Now login to the admin area of the site where you want to install the child theme and visit Appearance » Themes. You will be able to see both parent and child themes installed there. Click on the live preview button under the child theme to make sure everything is working as expected. Once you are satisfied, you can safely activate the child theme on your new WordPress site. We hope this article helped you learn how to use your child theme on another WordPress site. 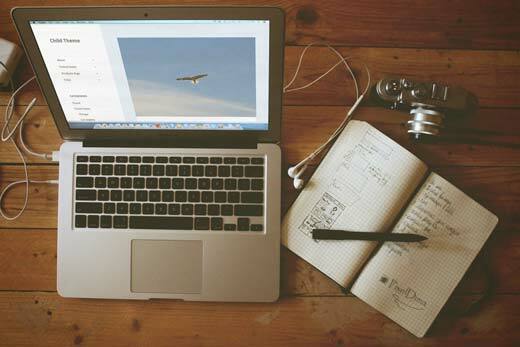 You may also want to see our hand-picked list of these 43 beautiful free WordPress blog themes. I see that’s how you install a child theme but I cant see to overwrite the code of the parent theme. I have installed a black theme with the correct labels and names, but still things will not change. Am i missing something? Can you show me an example of a child theme in use not how to install? If I m exporting my divi child theme will my content lost? thanks for the tutorial! my question is, don’t we need to change various url’s and links to correspond with the new site before uploading to a different domain? so could benefit from some sort of migration plugin? i’m about to do this and am stuck between conflicting ideas on the best way to go about it. i like your ideas best so i hope you can answer this for me and everything then goes smoothly…. If your child theme is properly coded, then it should not have any direct links. If it does have direct links, instead of WordPress functions to fetch relevant URLs, then you will need to fix that. WordPress is a great CMS that comes with set of frameworks, themes, modules and plugins to implement any complex business requirements. It is a flexible platform that allows a CMS developer to customize any functionality according to the requirements. A child theme in WordPress allows a developer to inherit all the functionality, features, and the code of the parent theme without making any changes to the parent theme itself. This feature helps to create a theme that is most suitable to a business without compromising on security. For large organization with multiple websites, WordPress provides an option to use the same child theme with other websites to better the consistency among different websites. The child themes can be modified further as per the requirements. I feel this to be a great feature that even CMS development companies can adopt to deliver websites with great features. Thank you for the information. I actually have a wordpress child theme and I used the child themify plugin. However, the theme Bouquet I’m using won’t seem to save any changes I make in the child theme. Any suggestions? I would really appreciate any assistance you could give. I’m not that tech savvy which may be a problem. Some WordPress themes do not work well as parent theme. Please contact your theme support. Thanks for posting this. This post helped me out a lot. It makes changing themes a lot eaiser. Thanks for posting this. It really helps guide you through the process, making it much easier. Please, if i have some plugin updates, is there a way to test the updates firstly at child theme? How would this works, is it possible? You can setup a local install on your computer (Windows | Mac)for testing purposes. Get 20% OFF on ChurchThemes.com premium WordPress themes and plugin.